Revolving around the themes of ʺLoveʺ and ʺWaterʺ this performance piece reflects on the reciprocal relationship between form and movement which is at the heart of both the calligrapher's and the dancer's art. The brushwork for these characters is created using an electronic brush. 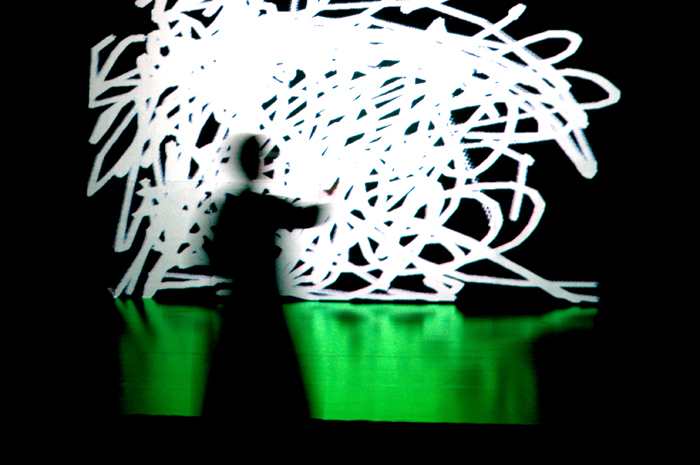 The calligraphy is projected on the stage backdrop in real time, where dancers are challenged to relate their own movements and formations to respond to the unfolding calligraphy on screen. As the performance continues, Noriko's calligraphy is modified and adapted to respond to the dance. The total effect is a feedback cycle which produces ever new forms and ever new movements for both arts. The realm of Calligraphy and Dance are not so foreign to each other that they cannot find common ground on which to communicate and collaborate. The concept of spatial composition and the philosophy of movement and pause can be found at the innermost core of both.